On Thursdays I go to my "downtown" office, which is about 25 miles away. If I leave early enough, my commute can be as short as 35 minutes, which gives me plenty of time for a long run at work (either along the park trails nearby, or on the treadmill in the gym within the building). This past Thursday, I didn't get out of the house as early as I would have liked and my 35 minute commute morphed into an hour. That could also be partly explained by the rain. I typically roll right out of bed and get in my car, where I've already put my work bag and my change of clothes. That day was essentially the same. 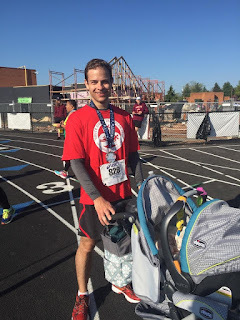 I'm not really one for race recaps, but I'll give one a shot here. I woke up at 5am and ran downstairs to eat some breakfast and have some coffee. My wife took care of Ellie in the middle of the night, letting me get as much sleep as possible. I figured I would return the favor and let her get a few extra minutes of sleep that morning. We planned on leaving at 5:30, but didn't make it on the road until closer to 6. Not bad considering we had a baby and a dog to contend with. Also, my sister was coming along for the ride, so we had a pretty full car for the 100 minute drive. 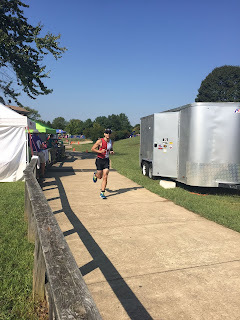 Just one short month after the South Riding Triathlon, I have my longest race of the year - the Giant Acorn International. I ranthisrace for the first time last year and was pretty happy with how I did, especially considering that 1500 meter swim was my first open water swimming race. I'm not going into this race with any specific goals, other than improving on my times from last year. However, while my running has picked up since the South Riding Triathlon, it's been at the expense of my biking. I'm not exactly feeling confident in my biking, nor my swimming, for that matter. 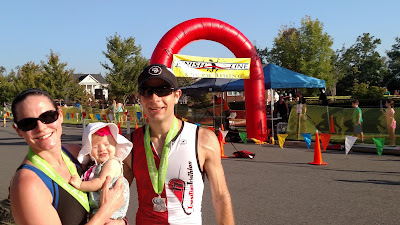 This Memorial Day weekend, I'm participating in the Jim McDonnell Lake Swim in Reston, VA. My wife, who was unaware that she was pregnant with our daughter at the time, did the mile swim last year and really enjoyed it. I chickened out and decided to do my first open water swim several months later as part of the Giant Acorn Triathlon. Here's a tip for any aspiring triathletes - don't have a race be your first experience with open water swimming. 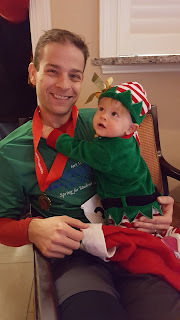 During the Giant Acorn Tri, I managed to do the 1500 meters in a staggering 35 minutes. That was really disappointing considering the huge strides I have made over the past several years in the pool (taking off 30 seconds/100m since 2011). Obviously, in addition to putting the time in at the pool, I have to get out and do some open water swimming, so that's what I'm doing this weekend. Nothing like feeling as if you're getting on track with fitness only to be derailed by another injury. This is a new type of pain in a familiar place. When I was ramping up my marathon training last time, I got a pretty bad case of patellar tendinitis from doing an interval workout on a treadmill. That was a pain that came on from overworking my knee and would flare up as I increased my workouts. It makes sense since tendinitis is the inflammation of the tendon, so by overusing it I'm rubbing it and causing irritation to it, which makes it progressively get worse. I had about 12 weeks of PT to get over it.